This leg of your journey is 338 miles from Waterford, N.Y., at the Hudson, to Tonawanda, N.Y., at the Niagara River and entrance to Lake Erie. In order to pass through the entire length of the Erie Canal your vessel must be able to clear a fixed bridge height of 15' 6". (If you can't clear this height, you must exit at Oswego). There are 57 locks on the Erie Canal that lift your vessel a total of 565 feet above sea level. 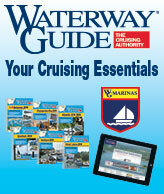 The Erie Canal is lined with dozens of canal towns offering all the services that a transient boater would need. Today's canal runs an average of about 9 feet deep. It has a vertical clearance of 21 feet between Waterford and Three Rivers (Oswego Canal junction), and 15.5 feet between the Tonawanda and the Niagara river. The largest vessels that can make the entire journey must be under 300 feet long, 43.5 feet wide, 9' draft, and a maximum 15' 6" height above the water. All recreational vessels passing through any lock or lift bridge on the Canal System must purchase either a Seasonal Pass, a Ten-Day Pass. For boats over 39 feet the toll is $50.00 for a tenday pass. Smaller vessels of course, have a smaller fee. Cruising the Erie Canal is a long (six or seven days) and a very slow cruise. Between moments of sheer excitement and reaching for your camera, there are long stretches of the canal where your own personal thoughts will seem to be the only things to change. By the time you're done, you will probably be itching to give your vessel some throttle and put a little speed back into your journey. More importantly, you'll be very thrilled over having shared this incredible experience. While slow, it is worth every moment. For more information go to www.nycanals.com.